BCFFC is a family camp designed for the enjoyment of our children and families. 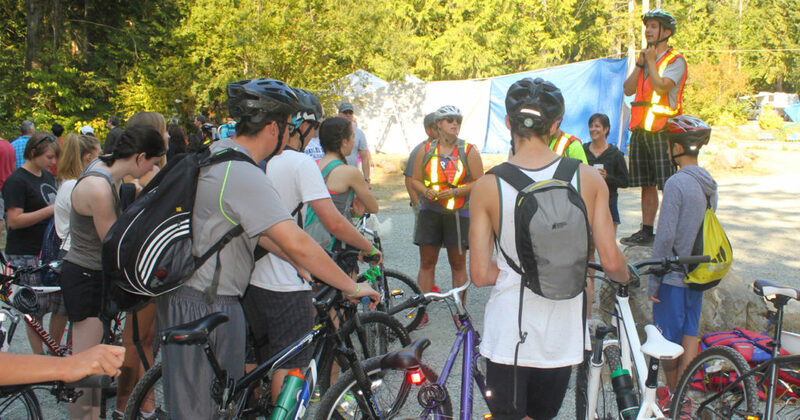 Safety rules and regulations are put in place by the campground and BCFFC to ensure we all have the best vacation possible. Please obey the following rules. Use of illegal drugs is not permitted at camp and will result in your family being sent home. You will not be invited to return. Violence is not permitted in camp and will result in your family being sent home. You will not be invited to return. All BCFFC water equipment must be signed out and returned by 9:00 p.m.
No lifeguards are present at Living Forest beach. An adult must accompany children under 12 at the beach. Bicycle helmets MUST be worn while in camp and on all out trips. Bicycles and helmets used for all programs MUST be in good working order. We strongly recommend that parents have bikes inspected by a bike shop before camp. If your equipment does not appear safe, you will need to rent equipment or miss out on scheduled out-trips. This is especially important for campers in grades 5 and 6 or participating in Les Aventuriers and Coureurs des Bois teen programs. A bike rodeo and mandatory bike check will occur on Saturday afternoon at 4 p.m. Dogs must be kept on leash for the safety and comfort of our camp families. Constant barking will not be tolerated. No dogs are allowed on the beach or public swimming areas. You must clean up after your dog. Problems associated with dog mess can result in dogs no longer being welcome at camp. Speed limits of 10 km/h through the park are strictly enforced. All loud noises must cease by 11:00 p.m. Campground check-out time is 11:00 a.m. Boats are not allowed in campsites and must be parked in the designated area. One picnic table and firepit is supplied per site. Fires are allowed in the firepits only; they are not to be moved on to grassy areas. Note: Complete fire bans are common in the campground and campfires may not be allowed during your camp week. Families should come prepared to cook meals without the use of a fire. The rules above apply to all camp families and any guests that might be present during camp week. If your visitors disobey the rules, they will be asked to leave and their actions could result in your family losing the opportunity to return to camp.